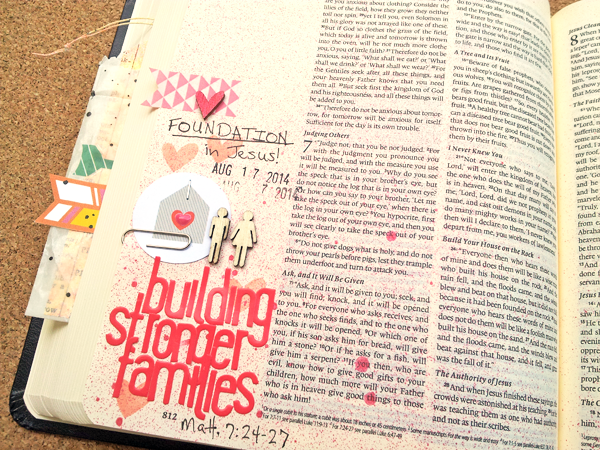 I was recently invited to a Journaling Bible Facebook group started by Shanna Noel. 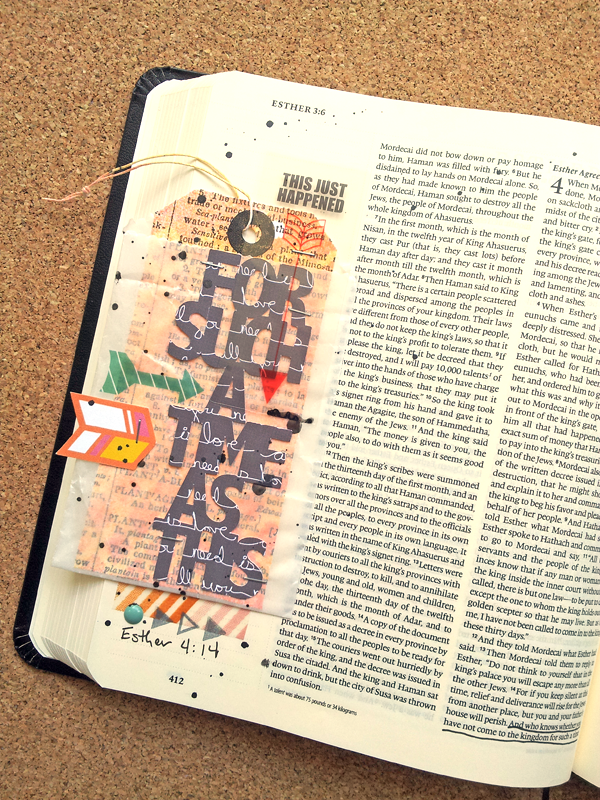 I've always written and underlined in my Bible, but when I was invited to this group, I discovered a whole new way to bring my love of creativity into note-taking in my Bible!! 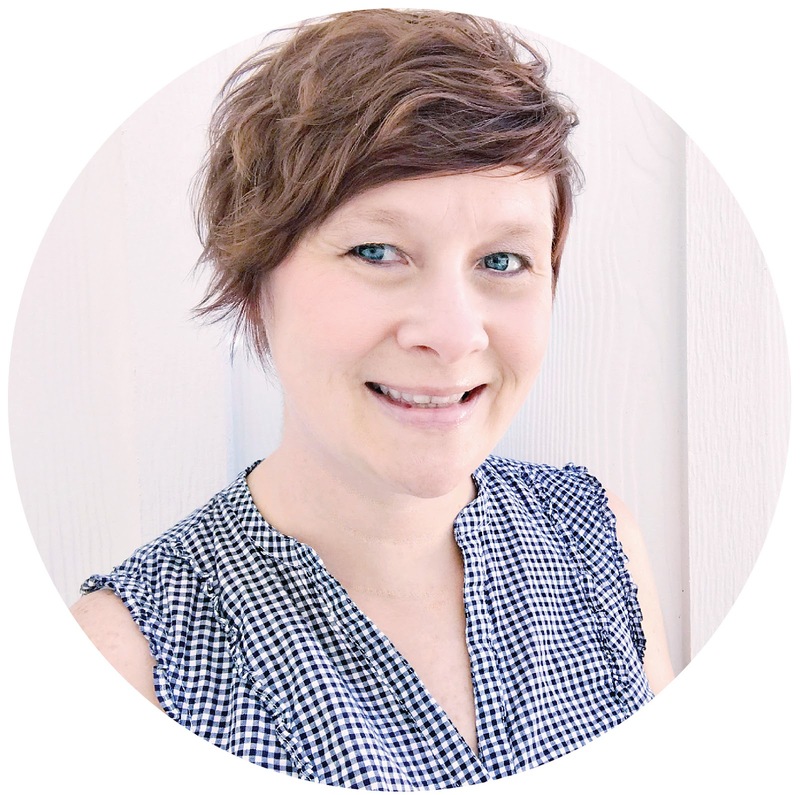 Yesterday, I was very excited to share a guest post on Shanna's Blog! I wanted to post here on my Blog today, and share the full post with you. I love that God gives all of us our own individual testimonies. Testimonies may have something in common, but each one is still our own personal experience. I grew up in church...like my grandparents took me every Sunday from the time I was a baby...grew up in church. I was saved at the age of twelve. As I got older, I did the typical rebellious teenager stuff, but remained in church. Even though I didn't always stay on the right path, I never strayed from attending church. I even worked in two different church offices for over 14 years, before I became a stay at home mom! Our current church is only the 5th church I've ever attended, in my span of 40 years. I believe in finding a church, staying, and being involved. I remember sharing in our Bible Study class one Sunday, as we were discussing testimonies, that mine was just a typical, boring testimony...no huge revelation, or transformation from a life of drugs or substance abuse. Our teacher pointed out, that my testimony was just as relevant as any of the drastic testimonials of being saved, because there are other people out there like me, that need to hear the same story. That even though we grow up in church, we are still separated from God, until we ask Jesus into our hearts. WOW! So, that is why I chose to journal Isaiah 6 as one of the first entries in my Journaling Bible, once it arrived. This is such an amazing description of God's holiness and our separation through sin, until we realize that sin and turn away from it. And one of the most powerful verses is 6:8 - "And I heard the voice of the Lord saying, 'Whom shall I send, and who will go for Us?' Then I said, 'Here I am! Send me.'" This is the perfect picture of sin separating us from God, repenting, and then doing God's will. He gives us the tools to go out and share our testimony, when we are willing to say "Here I am! Send me." We just started a new sermon series on Building Stronger Families. My hubby and I are working to instill the Word of God and Christian values in our children. But honestly, we mess up so many times a day! I'm not gonna lie..it's not like the Duggar's around here, and we only have 3 kids, not 19!! There are days of a lot of yelling, or when I feel like putting them out by the road, with a Free Kid sign around their neck. But, God continues to teach us and help us grow, and I am so glad that our Pastor is sharing this sermon series. The first week, was based on Matthew 7:24-27, and having our foundation in Jesus. I can't pray and ask God to make my husband or children perfect. I need to pray for God to change me and show me how He wants me to be obedient. And my foundation, can't be my husband or my children. It has to be Jesus, because only He can fulfill my every need. 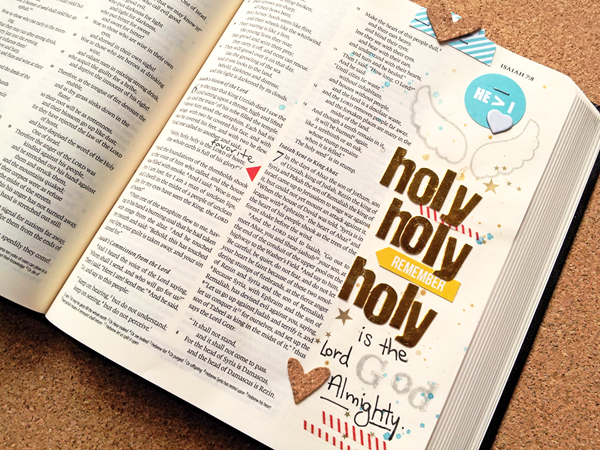 Do you have a favorite book of the Bible? After going through a Beth Moore study of Esther several years ago, it immediately became my favorite book. Here is poor Esther, who kind of gets thrown into a situation she didn't ask for and ends up having to make a huge decision that not only affects herself, but all of her people. After going through Esther, I learned that we have to decide to be obedient...always. It can't be a situation based decision, when God calls us to something. I don't want to come to a situation, and say, "Sorry God, I weighed the pros and cons of what You asked me to do, and I'm just not feeling it today." But I also love that Esther took time to fast and pray and had others do the same for her, before she tackled going before the King. Just because God calls us to do something, doesn't mean we have to go in alone. I love being able to ask for prayers and help from our church family, and know that other Christians are lifting me up in prayer, when I need it. The last scripture, I want to share from today, is found in 1 Peter 2:11. It is easy for me to get caught up in the things of the world. There is always so much going on around us and so much to keep us distracted and busy. I love listening to Christian songs, that reinforce the message of God's Word. For some reason, I stink at memorizing scripture, even though I have tried many times. But give me a song, and I usually know it almost all the way through, by the second listen! I've always loved Third Day and their song "Alien". And another favorite is "Where I Belong" by Building 429. Both of these songs talk about being aliens and strangers here on earth. I love that these are constant reminders for me, that this home is only temporary, and we can look forward to eternity in heaven. So sometimes, I have to take a step back from something that I consider soap opera dramatic or too huge for me to handle, and realize that in the grand scheme of things, it's only a teeny tiny fragment of my days here on earth. Then I can focus on listening to God and how he wants me to handle those situations. But it's also important for me to remember, that even though this isn't my "home", there is still work to do here and God has a plan for my life and is continuing to work in it daily. 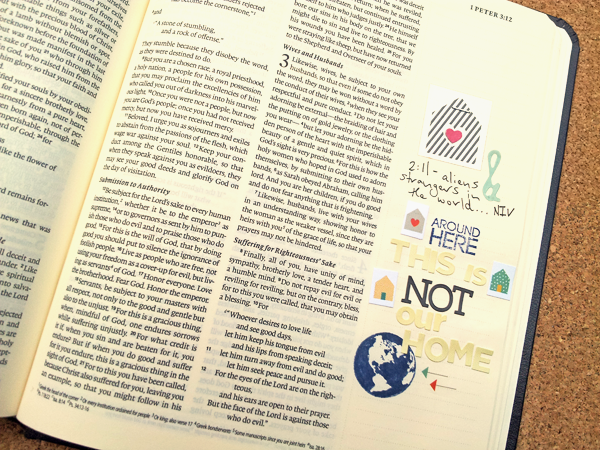 If you would like to find out more about the Journaling Bible, you can visit Shanna's Blog and find the Jouranling Bible Community on Facebook HERE. 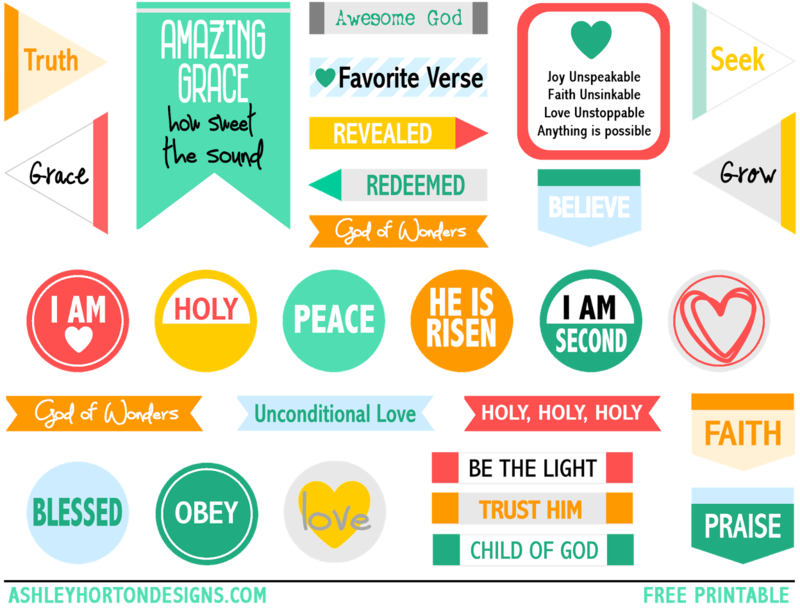 I am also sharing a FREE Printable that can be used along with your Journaling BIble. 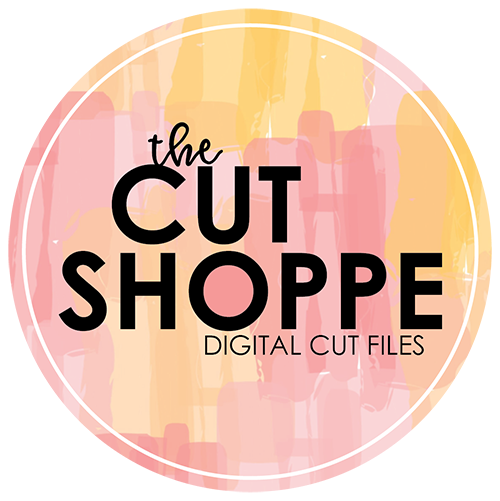 You can find the FREE download HERE on Shanna's Blog. Thanks for stopping by today, and I hope you have been inspired, and that you enjoy using the Printables! American Crafts 2014-2015 Design Team Blog Hop! American Crafts 2014-2015 Design Team!